4.25 x 5.25" 5.5 x 8.5"
Buy More Sales Books Carbonless Save More! Each pack contains 5 books. Each book contains 50 of 4-1/4x5-1/8" slips. Each form is numbered. Made in the USA. Yes! We can print it! Its easy to get your business information printed on register forms and receipts. Call our Custom Print Department at (800) 547-9727 ext 4. for details. 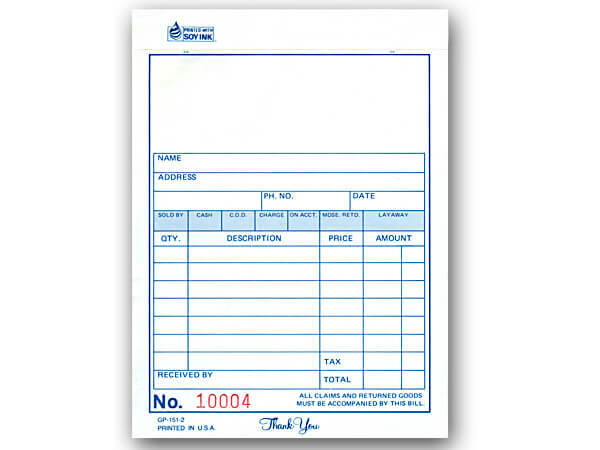 Our carbonless Sales Books are available as blank forms or can be quickly personalized with your store name and address. The 2-part sales books are available in two sizes, each containing 5 books with 50 slips per book. Each form is numbered for easy tracking. Made in the USA! Call our Custom Print Department at 1-800-547-9727 ext. 4 to have these sales books personalized with your store information.